Happy Friday everyone! I hope you all had a lovely week! With party season fast approaching I though it's about time to start browsing for the best party frocks. 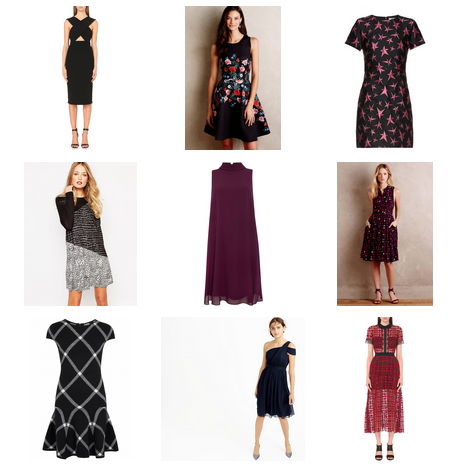 Shopping for a specific item can be quite overwhelming, so I thought I'd share with you my top 9 picks from one of my go-to online shops, Lyst. The black midi dress is a true wardrobe staple and I love the criss-cross detailing on the top. I would accessories the dress with a pair of statement earrings and clutch. The second dress is just so perfect for party season and I love the gorgeous floral embroidery. It wouldn't be Christmas season without star prints and this fun dress makes for the perfect cocktail dress. I really like the cool print of this dress and I would pair it with overknee boots. The colour and cut of this dress is just gorgeous and flattering. I love a good shirt dress and this would look gorgeous with a faux fur stole. Plaid is one of my favourite autumn / winter prints and I love the cute dropped hemline of this dress. This dress is another must-have for any wardrobe, this Grecian-inspired dress is perfect for winter weddings and formal Christmas dinners. Last but certainly not least, this stunning lace statement dress is high up on my wish list.